A press copy of the Starfinder Core Rulebook was provided for the purposes of this review. Over the years Paizo Publishing has carved a successful name among tabletop roleplaying fans, releasing dozens of Pathfinder rulebooks, supplements, full campaigns, and modules. Starfinder represents Paizo’s first entirely new roleplaying system since Pathfinder’s release in 2009. In many ways it’s a science-fiction version of Pathfinder, expanding on those rules (which is itself largely based on D&D 3.5e) while adding a few unique twists of its own. 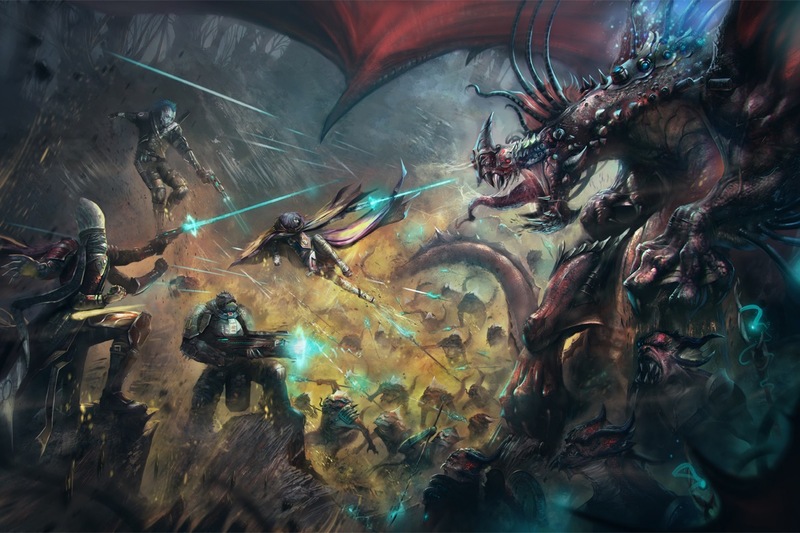 Starfinder draws upon the best sci-fi archetypes, stories, and concepts from across media to create a full-fledged, detailed universe rife for adventure. 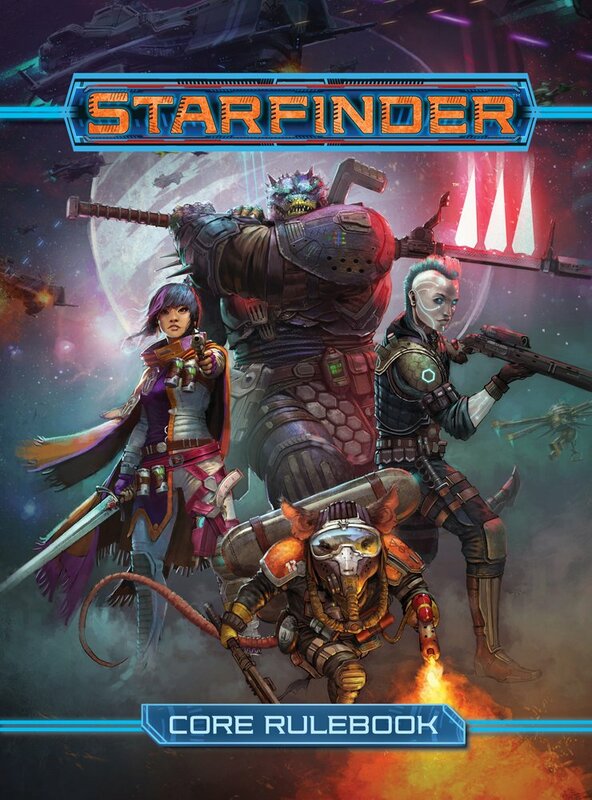 The Starfinder Core Rulebook holds over 500 pages of everything you need to create a character and play the game, as well as helpful tips, lore, and rules for running the game as a Game Master. Like Pathfinder all the information is contained in a single book, whereas Dungeons & Dragons Fifth Edition splits it between a Player’s and Dungeon Master’s Handbook. Only needing to purchase a single book is a nice perk, though it comes with the cost of giving less in-depth information for potential Game Masters, which I’ll get into later. The book is divided into 13 chapters. Most of the sections should be immediately recognizable to anyone who has experience with Pathfinder and/or Dungeons & Dragons. A brief overview in Chapter One introduces the concept of a role-playing game, concluding with a nice little two-page gameplay example. These little samples are used several times throughout the book as dorky but helpful examples of actual play sessions involving traps and combat, starship battles, and vehicle chases. Chapter Two introduces character creation, giving a step-by-step process for designing a Starfinder adventurer. The major categories like races, classes, and skills are detailed in subsequent chapters. 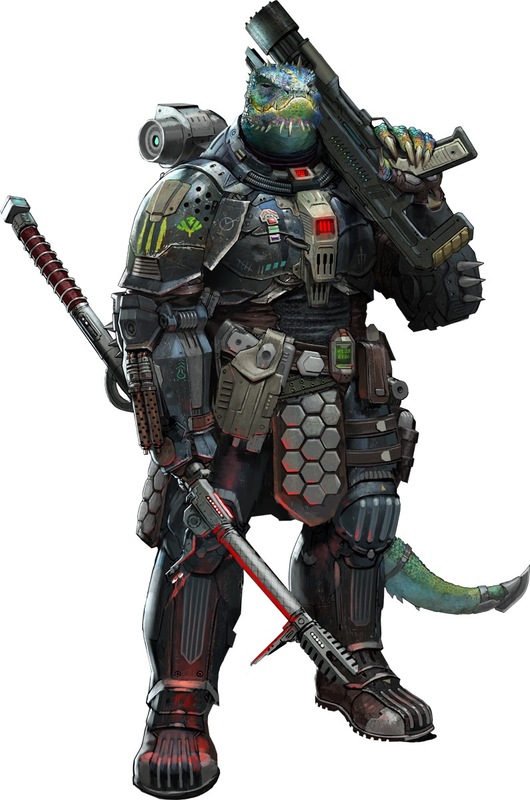 Coming from Pathfinder or Dungeons & Dragons, the biggest new concepts to Starfinder player characters are Stamina, Resolve Points, and Themes. Stamina is basically a secondary health bar on top of Hit Points. Every character has both Stamina Points and Hit Points. Stamina represents more superficial damage and general exhaustion, while Hit Points are your actual nasty wounds or mental anguish. I picture Stamina damage when superheroes get into scrapes, whereas Hit Point damage is John McClane at the end of every Die Hard film. Stamina is more easily regenerated than Hit Points, with the latter almost always requiring some sort of outside healing like spells or potions. Stamina can be regenerated by spending 10 minutes and one Resolve Point – functionally equivalent to a Short Rest in D&D 5E. The system reminds me of Pillars of Eternity‘s excellent Health and Endurance mechanics. It’s not quite as smooth or game-y as Pillar’s- Stamina doesn’t automatically regenerate at the end of a fight. But it does look like a solid compromise between letting heroes self-heal while making sure health has significant meaning over the long-term. Resolve Points act similar to Hit Dice in D&D but with way more uses than just healing. With healing it’s much simpler – simply spend a Resolve Point to fully heal your Stamina. Resolve is also a resource that can be spent to activate certain class abilities. For example, the Mechanic can spend one Resolve Point to create a Scout drone, provided they’ve acquired the level eight Scoutbot perk. Resolve Points can also be used to stabilize yourself if you’re dying, as well as even heal to get back into the fight. You lose Resolve Points every round you’re down, however – and if you lose them all you’re toast. 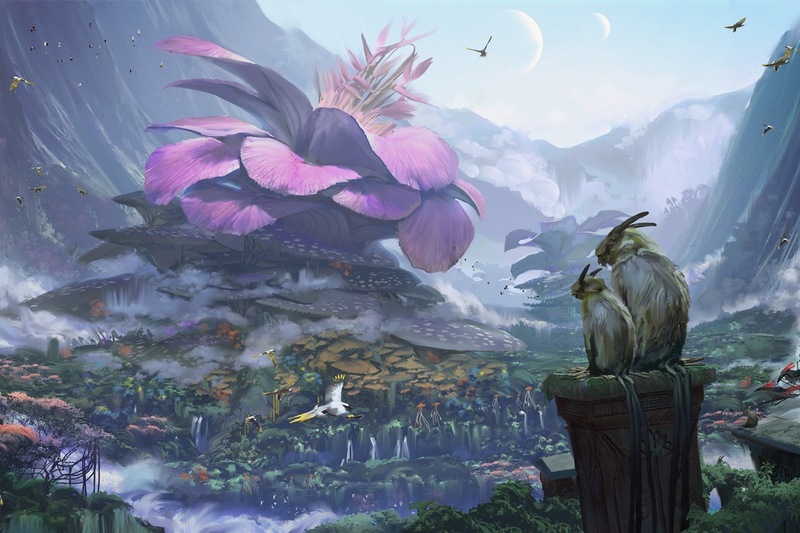 Themes are similar to the Backgrounds of D&D Fifth Edition, but with more expanded functionality. A total of nine themes are available, including Bounty Hunter, Mercenary, Scholar, and Ace Pilot, as well as a tenth Themeless build that provides some generic bonuses. Themes provide a small stat boost as well as several level-dependent perks. Many of them are very niche and GM-dependent – particularly the Bounty Hunter’s ability to track specific targets. But Themes feel much better integrated into the rules system than Backgrounds, and I love that you continue to gain very thematic abilities and skills as your grow. Both Themes and Resolve Points are great examples of Starfinder taking established concepts (Backgrounds and Hit Dice) and adding more functionality and flavor. 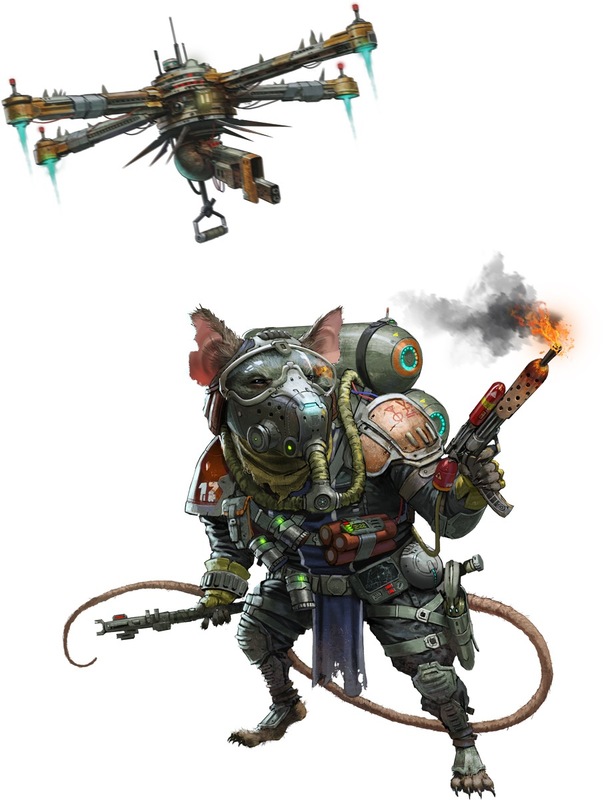 Compared to similar game systems, Starfinder seems a little light on races and classes. There are seven races and seven classes to mix and match, on top of the ten themes. Most of the classes have obvious analogues to familiar fantasy archetypes. There are only two spell-casters. Mystics are your priest or cleric wisdom-based casters. Technomancers are basically wizards. Operatives are straight-up rogues; they even have an increasingly damaging sneak attack called ‘trick attack.’ Soldiers are your standard heavy fighters. From there it gets a bit more interesting. Solarians are basically Jedi – able to craft a powerful weapon or armor out of the stars. They resemble monks with a slightly complex system of balancing gravity and solar powers. The Mechanic is probably my favorite class. It’s ripped straight out of Shadowrun as both a Decker and Rigger. They’re proficient with hacking into computers and piloting vehicles as well as creating their own drones. You can choose between having a permanent drone pet (hover, combat, or stealth) or an Exocortex, which sounds exactly like the Brainpal from the Old Man’s War series. The Envoy is for players that want to talk their way out of problems. I appreciate a good social-focused class and Envoy has a lot of neat tricks going for it. It’s basically the D&D 4E Warlord, able to command allies and enemies during battle. They’re also your Bard-like skill monkey. I like that every class has its own list of special feat-like abilities and perks to choose from as they level up, not unlike D&D’s Warlock invocations. It’s a bit of a double-edged sword, as it also means that every character needs to be carefully planned, and there isn’t really an easy class to play. The races provide a nice range of hulking brutes and diminutive furry folk, though most feel more fantastical than alien. 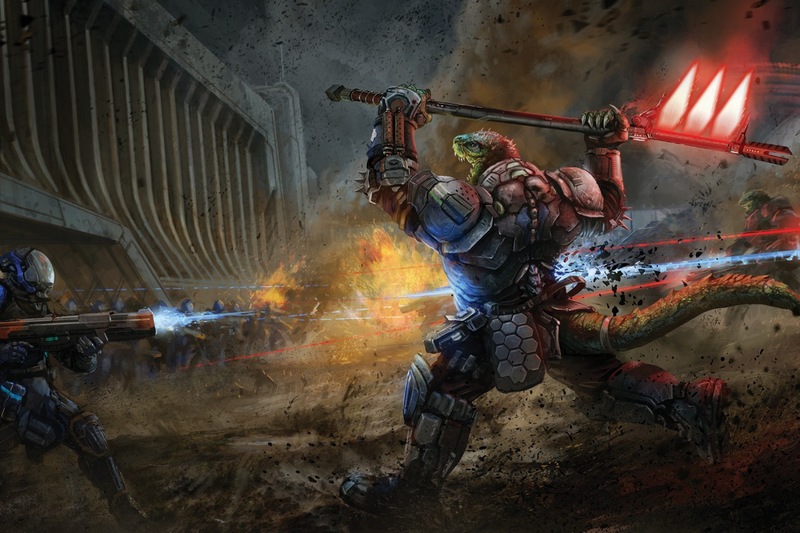 The Vesk are giant warrior lizards while the Ysoki are scavenging ratfolk. Humans are there for you boring folks as well as self-aware humanoid androids. The psychic Lashunta are the stand-in for elves, and come in two slightly different varieties. The last two are the most interesting – the Kasatha and Shirren. The Kasatha are a four-armed race who arrived in the Pact Worlds on a giant world ship. They’re steeped in a rich culture and always cover their mouths. Four arms gives you a nifty advantage in combat options – there’s even a special feat that lets you auto-fire with four guns at once! The Shirren are insectoid aliens with a neat backstory. They’ve broken away from the Zerg-like Swarm and become highly individualistic and peaceful. Each race gets a detailed break down of their traits and stats as well as their society, alignments, naming schemes, relations to other races, and why they become adventurers. I particularly like the sidebars that include reasons on why you’d want to play as that race – and how others would treat you. Skills and feats are a major part of Starfinder as they were in Pathfinder, but thankfully both have been scaled down and streamlined. 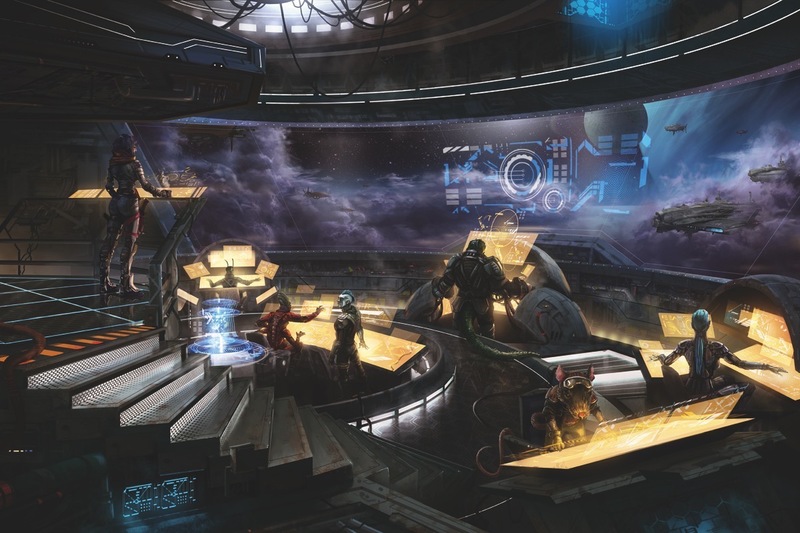 There are only 20 skills in Starfinder, including Acrobatics, Computers, Engineering, Perception, and Piloting. The skill section does a great job giving detailed descriptions and rules of all the various uses of each skill. For example, Engineering lets you arm explosives, assess stability of structures, craft items, disable devices, identify constructs and technology, and repair items. Feats are probably the single most recognizable components from Pathfinder outside of the actual attributes. Feats can improve saving throws, grant weapons specialization, add additional combat moves, and more. Most require prerequisites, so some planning will be required at character creation. The equipment chapter might be the most impressive part of the entire book. 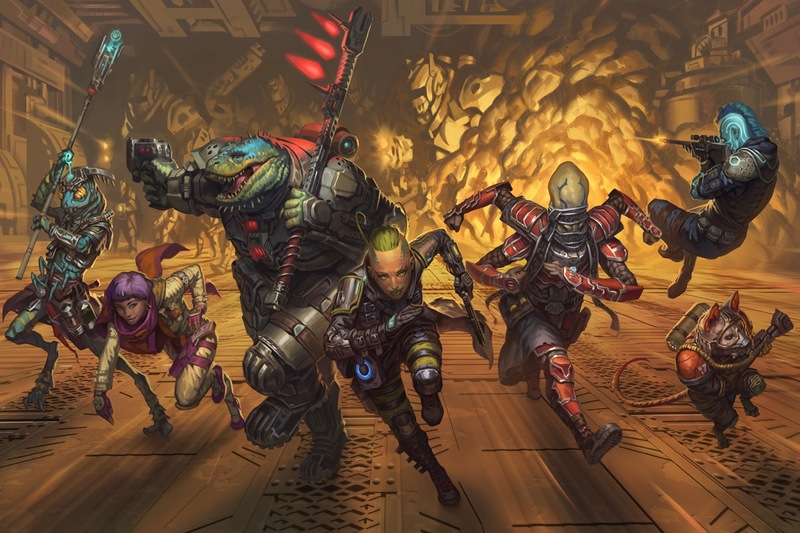 It’s here that Starfinder really lets loose with some new concepts, creating a loot system that’s more action RPG (like Borderlands or Fallout) than D&D. With a sci-fi universe of magic and tech you can go nuts with the weapon designs, and Starfinder just does that. We’ve got laser pistols, plasma rifles, chainsaw swords, cryo grenades, knives, sharp sticks, etc. Pages and pages of weapons are listed to suit your every desire. Every piece of equipment has an item level associated with. It’s an incredibly easy-to-use system that gauges how powerful a piece of equipment is relative to the players – unlike D&D’s use of common, uncommon, rare, etc. I know that a Comet Hammer is a level 10 weapon, while a Level 1 player could easily find an Azimuth Laser Pistol. There’s a lot of helpful notes for GM’s when it comes to equipment. NPCs should only carry about a week’s worth of credits on their credstick. Players should be able to buy their level + 1 items at most places, with + 2 at major settlements. Most weapons also have critical effects, making for fun additional cool factors when players roll a crit, such as knocking down opponents or causing them to suffer ongoing bleeding damage. In addition to the incredible variety already listed, weapons can be augmented with Weapon Fusions, adding additional effects and abilities to a favored sidearm. Likewise armor has upgrade slots where new perks and functions can be installed. Starfinder goes full Shadowrun when it comes to cybernetic enhancements. Chop those limbs up and get you some chrome! Cybernetics are expensive but can offer some really cool new features, like Robocop-style hidden holsters and most of the upgrades from a Deus Ex game. Install a Dragon Gland in your throat and breath fire! Your players may not be finding ancient magical weapons nearly as much as in a fantasy game, but there are a lot more fun things for them to spend their hard-earned (or completely ill-gotten) money on. Starships are given their own chapter for good reason. Not only do they have entire stat blocks, like a mix between an NPC and an item, but they’re a critical part of the adventuring party. Starfinder is designed around giving every party a communal starship to travel in. It provides transportation to different worlds and adventures, and can be upgraded to include several different rooms and amenities, like cargo holds, science labs, and even shuttle and hangar bays for smaller ships. Combat with starships takes place on a unique hex grid where actual length and distance is completely abstracted. Combat is designed to emulate Star Trek with each player taking on a different role. Five roles are available: Captain, Engineer, Gunner, Pilot, and Science Officer. The nice thing about this system is it lets any kind of player character feel useful in a space battle. A charismatic diplomat can play the captain role, boosting their teammates and disrupting the opponent. A more intellectual character can operate the targeting scanners and avoid hazards as the science officer. Still, anyone who’s not steering and shooting is going to feel more supportive rather than active. Rules for playing the game are outlined in chapter eight and should be pretty familiar for anyone who’s played a d20 system. The biggest difference is that AC has been split between Kinetic Armor Class and Energy Armor Class, making it useful to carry different kinds of weapons to exploit any weaknesses. Magic is also easily recognizable from D&D/Pathfinder, with many of the exact same spells and spell schools. With only two spell-casting classes and six levels of spells magic is a lot less complicated and intimidating. You’ll still be able to heal, mind control, raise dead, and force choke; they mostly trimmed the fat from more situational and role-playing heavy spells. Nearly 400 pages are devoted to character creation and playing the game, but what about actually running the game for the poor Game Master? Unfortunately we’re left with only about 100 pages of information. Paizo does squeeze helpful information on environmental hazards, gods and goddesss, factions, and story ideas. 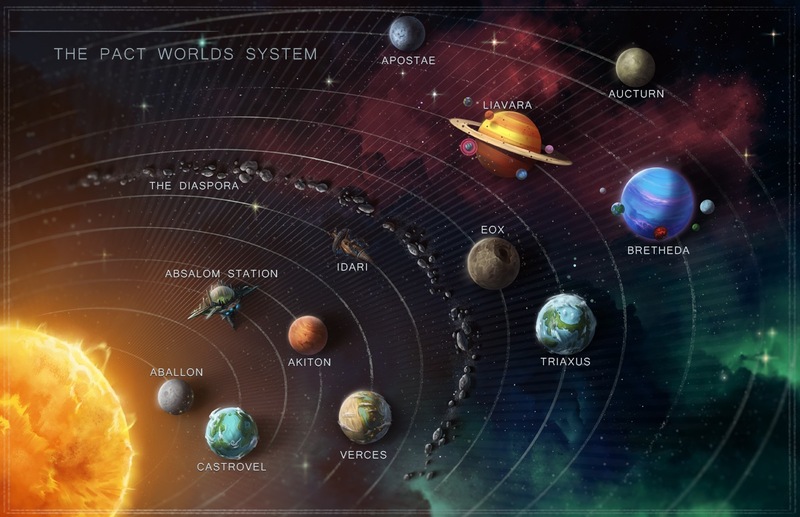 There’s lots of useful lore and history surrounding the Starfinder universe, mostly broken down into different planets. There’s a quantity over quality approach with each area, providing dozens of planets and locations with a few paragraphs to describe their unique qualities and possible adventure hooks. There’s Absalom Station, which is basically the Citadel from Mass Effect. Verces, the tidally locked planet with permanent day and night sides, and Akaton, a dying industrial world perfect for your Mad Max-inspired adventures. And those are just among the official Pact Worlds. The vastness of outer space contains an infinite array of planets to make up, or explore the listed examples. Arquanad the sentient planet that fucks with your mind. Embroi, a secret outpost to the dimension of Hell. Preluria, a gas giant that’s home to psychic gas oozes. These planets and locations are neat, but they provide the barest level of background information. Many GMs will need to purchase supplemental material to really get a handle on the Starfinder worlds and factions. Those that are adept at crafting their own homebrew worlds (or universe in this case) may be more satisfied at the nuggets that are given. The Core Rulebook ends with a chapter on converting PCs and NPCs from Pathfinder over to Starfinder. This is particularly useful for monsters, as the Rulebook doesn’t come with any NPC statblocks itself. The rules are simple and straightforward, adding the new Starfinder quirks like split AC and Stamina. They also allow for the use of Pathfinder races, which nearly doubles the number of playable races, including full stats for elves, dwarves, and halflings. From a player’s view the Starfinder Core Rulebook provides everything I need to get excited about the game, learn how to play, and create a successful adventurer. From a GM’s perspective it’s a little lacking. You’ll have a big leg up if you’re experienced with Pathfinder and/or D&D, but you’ll need to supplement with additional GM books and Adventure Path modules if you don’t want to fill in a lot of blanks yourself. Wonderful artwork that evokes the perfect combination of Shadowrun and a swords-and-spells RPG. Equipment is varied and expansive with many fun options and choices, including armor upgrade slots, weapon fusions, cybernetics, and vehicles. Starships are a big part of the game and the role system is a neat way to involve every player no matter their specialty. Skills, feats, and spells have been condensed and trimmed down to much more manageable levels. The Game Master sections are limited; locations offer more quantity over quality when it comes to information. Very limited artwork and pictures of equipment. Some classes feel a bit too analogous to standard fantasy RPG classes. The Verdict: Starfinder is a well-polished space opera RPG that successfully builds upon Pathfinder and draws elements from our favorite sci-fi games, movies, and books.